The magical Indonesian island of Bali attracts thousands of holidaymakers each year, promising an unforgettable tropical vacation. Some visitors dream of staying on the edge of the ocean and stepping out of their accommodation onto the beach, while others prefer to wake up to the sounds of the rainforest. Fortunately, there are ideal accommodation options to suit all tastes, ranging from romantic remote island hideaways to sprawling resorts offering multiple pools, restaurants, and facilities. There are family-friendly resorts that offer a kids’ club (so parents can relax a little) as well as special kiddies’ pools and play equipment, and then there are romantic adult-only resorts offering couples the last word in pampering and romance. 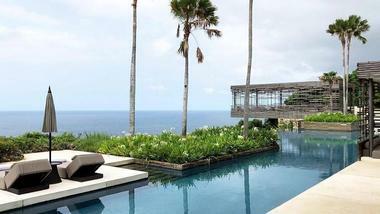 All the following resorts are dedicated to providing visitors with a memorable Balinese vacation. Selected as one of the UK Daily Telegraph’s 2017 Top 10 Bali hotels, the superb Alila Villas Uluwatu will blow you away with their incomparable views and luxurious appointments. 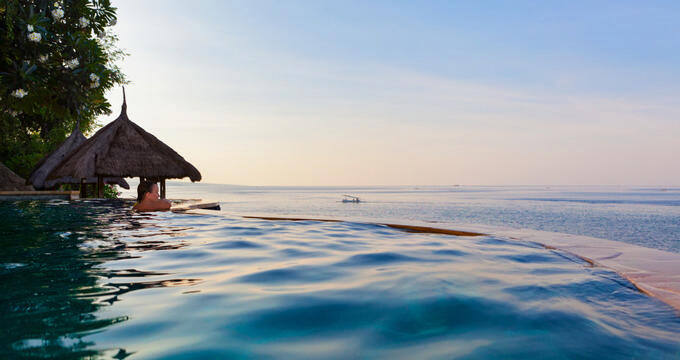 The resort is set on limestone cliffs towering over 300 feet above the ocean and offers a selection of modern and luxurious one, two, and three-bedroom villas, each with their own private pool and stunning ocean views. The decor is modern and very relaxing, incorporating traditional Balinese design features of wood, stone, water, and rattan as well as a good mix of indoor and outdoor areas. The hotel has three restaurants, superb public areas, and a wonderful spa and fitness center, and the concierge service is on hand to organize a variety of tours and experiences. Nestled amongst 90 hectares of landscaped gardens above Jimbaran Bay, AYANA Resort and Spa is one of Bali’s most beautifully located luxury resorts. The resort shares facilities with the adjacent RIMBA Jimbaran Bali, which means guests have full access to both stunning resorts (a free inter-resort shuttle us provided). In total you can enjoy 12 swimming pools, 19 restaurants and bars, a private beach and beach club, and the amazing Spa on the Rocks. Your sumptuous accommodation could be in an ocean-view guestroom, suite, or villa – all options offer the ultimate in comfort and luxury. If you want, you can do nothing at all but soak up the sun, or you can enjoy a round of golf or a game of tennis. Yoga, cookery, perfume-making, and batik-painting lessons are available, or you can visit nearby cultural attractions and markets. If you are looking for peace and serenity without all the big-resort frills, consider spending your Bali vacation at the Bukit Taman Cottages on Lembongan Island. There are only five cottages in the complex, so there will never be more than 10 visitors at a time – pure bliss. Each of the typical Balinese wooded cottages has a king-sized bed, a private outdoor shower, and a verandah with wonderful views of the sea. 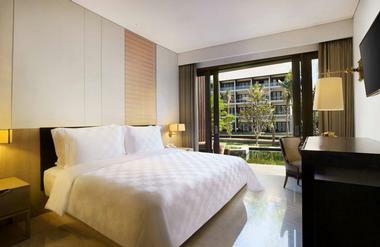 The common areas include a beautiful pool area, a garden terrace, a restaurant, and an outdoor bath house. There are two great beaches located less than a mile from the cottages, and your hosts will be happy to suggest activities and restaurants on the island. Try your hand at diving, snorkeling, canoeing, or fishing. Imagine an intricate fusion of Italian style, Oriental exotism, and unspoiled Balinese nature and you will get some insight into what you can expect from the Bvlgari Resort Bali in Uluwatu. The resort occupies a prime location 500 feet above the Indian Ocean and accommodation options include a choice of extravagant villas and mansions fit for a king. Couples can opt for a one-bedroom villa while larger groups can spread out in a four or five-bedroom mansion. There is a choice of three restaurants serving Asian and Italian delicacies and you can work off the calories at the fitness center, the Workshop Gymnasium, or in the amazing Bvlgari Spa. Your leisure concierge will be happy to arrange all your day trips and excursions. Located on a huge estate approximately 9 miles from Ubud, COMO Shambhala Estate is ideal for a relaxing holiday or a journey into wellness. Many guests come to the estate to embark on a holistic wellness program under the guidance of the on-site yoga teacher, Ayurvedic doctor, and dietician, but you will find that the resort is also ideal for an indulgent vacation. The accommodation (in rooms, suites, or villas) is the epitome of modern Balinese style and offers all the mod-cons you would expect from a COMO hotel. You can take your meals at the Kudus House restaurant (Indonesian specialties) or enjoy balanced and healthy meals at Glow. The resort will arrange all your activities and excursions, from cycling and cultural visits to white-water rafting. The lush Four Seasons Resort Bali at Sayan is waiting to welcome visitors to an amazing riverside sanctuary that appears to float above the lush Balinese jungle along the banks of the Ayung River. The resort is accessed via a dramatic suspension bridge that leads you to a spiritual world where comfort and luxury are the order of the day. You can choose from a selection of rooms, suites, and villas, all of which feature beautiful Balinese decor and spa-like bathrooms where you can soak away the stresses of the outside world. The resort places an emphasis on wellness, and various wonderful treatments are available at the Sacred River Spa. Dining at the river-side Ayung Terrace is an adventure into Indonesian cuisine. 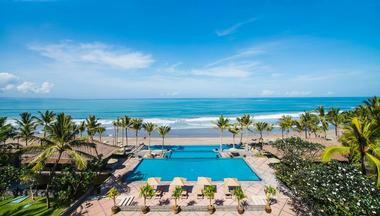 Conveniently nestled right on the edge of Bali’s legendary Kuta Beach, the Hard Rock Hotel Bali is an ideal choice for an active and energizing Bali vacation. The hotel has over 400 elegant rooms and suites, all of which are decorated with memorabilia of the great rock ‘n roll music revolution of the ‘50s to the ‘90s. 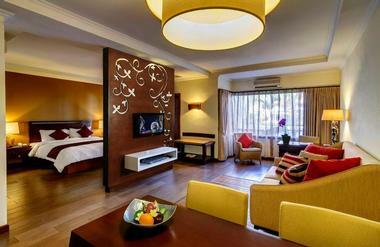 The family-friendly hotel even has special children’s suites with bunk beds and funky decor. Outside you will find three swimming pools, a rock-climbing wall, spa, gym, kid’s club, and a variety of eateries including a Jamie’s Italian. At night you have a range of music-related entertainment to enjoy on site, and the TABU children’s nightclub provides entertainment for teenagers. Located in Tanjung Benoa within easy access to a wide range of watersports, the Ibis Styles Bali is a budget hotel that is popular with both couples and families. The rooms are clean and modern, furnished with either a queen-sized bed or twin beds, and most of them overlook the pool. They offer unlimited free Wi-Fi, a fridge, tea and coffee making facilities, air conditioning, a personal safe, and an LCD TV. An extra bed or cot is available for children. In addition to a great swimming pool, there is also a children’s playroom, restaurant, and bar on site and guests have complimentary access to a private Ibis Beach Club. Occupying a prime location on exclusive Jimbaran Bay, the Intercontinental Bali Resort beautifully blends into the lush island landscape. A perfect marriage of traditional Balinese architecture and modern convenience, the hotel provides the ideal atmosphere for a relaxing exotic vacation. You can choose from a selection of beautifully appointed luxury rooms – treat yourself to an executive room or suite, both of which come with a lot of extras including butler service. There are several dining choices, including the chance to dine alfresco on the edge of the beach. You can spend your days relaxing around the beautiful pools and beach or simply while away the time in a hammock beneath a swaying palm tree. A 10-minute drive from Ubud will bring you to Komaneka at Tanggayuda – a secluded river-side retreat in the heart of the Balinese rainforest. The resort features bold modern architecture surrounded by lush vegetation and when you step into your pool villa you will be cocooned in a private haven of luxury. On-site amenities include two swimming pools with sun decks, a grassed courtyard for afternoon tea, a library, a boutique, a yoga studio, and the lovely wooden Spa House. In addition, there are two restaurants and you can take Balinese cookery classes at the Paon Bali pavilion. Should you feel the need to explore, you will find most of the popular attractions nearby. Located right on the beach at Nusa Dua, the Meliá Bali Nusa Dua resort has everything you need for a truly relaxing Balinese vacation. You can spend your days soaking up the sun around the lovely free-form pool or settle onto your beach lounger to relax and unwind. The resort has five restaurants and bars where you can enjoy all your meals (a full-inclusive package is available), and there is a large children’s playground and kids’ club so that parents can relax. The rooms are beautifully appointed – most have views over the pool and gardens. In addition, you can enjoy tai chi, tennis, volleyball, and yoga or simply make your way to the spa for a pamper session. Offering two beautiful outdoor pools and direct access to the beach, Nusa Dua Beach Hotel and Spa is a great choice for your vacation on the exotic island of Bali. The outdoor public areas have been designed to resemble a Balinese palace and your luxury guestroom (even the least expensive room) is fit for a king, featuring subtle Balinese decor, luxury beds and linen, a rain shower, and a private balcony or terrace. (If you want even more luxury, book a suite in the Palace Club.) There are nine hectares of tropical garden to explore and more than 650 feet of pristine beach. The resort offers a choice of five restaurants, a sumptuous spa, a gym and sports center, and a kids’ club to keep the little ones happy. 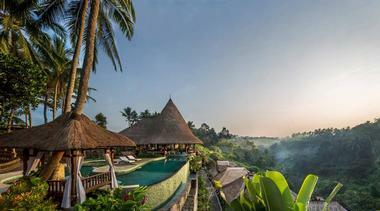 Surrounded by 8 hectares of lush gardens and pools, RIMBA Jimbaran Bali is part of the much larger Ayana Bali Resort. Accommodation at RIMBA is luxurious to say the least – you can anticipate a spacious modern room or suite (some with direct access to the Lagoon Pool) furnished in a contemporary Balinese style with all the luxury touches you require for a relaxing vacation. Guests at RIMBA enjoy access (and a free shuttle) to all the facilities of the Ayana Resort – 12 swimming pools, 19 restaurants and bars, a private beach, and beach club are all awaiting you. In addition, you can enjoy the fabulous Spa on the Rocks, take a Balinese cookery class, or enjoy a calming yoga session. 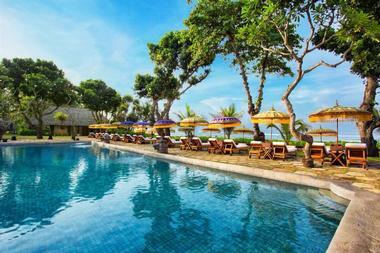 Benefiting from an idyllic location in Kuta, the ANVAYA Beach Resort is perfect for couples and fun for families. The resort offers direct access to beautiful Kuta Beach, where visitors can enjoy a wide variety of watersports or simply relax on a recliner and watch the world go by. Inside the resort you will find a beautiful pool area overlooking the ocean, a gym, the Sakanti Spa, the Anvaya Kids Club, three restaurants and a pool bar that serves drinks and snacks all day. The spacious public areas at the ANVAYA are beautifully decorated to reflect refined Balinese culture and style, a theme that is continued in the luxury guestrooms, all of which have direct pool access or private balconies. Tucked away amongst the rolling hills and rice paddies of the Balinese highlands, the Chedi Club offers a delightfully decadent retreat close to the artists’ town of Ubud. 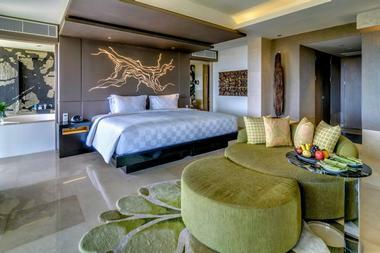 Each of the 25 individual villas has been designed to provide a luxurious and mind-restoring experience. 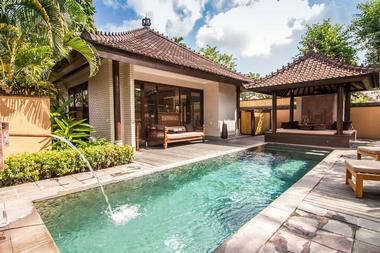 Genuine artworks and superb indoor-outdoor bathrooms offer a uniquely Balinese atmosphere, and you will have the services of a butler to ensure your every wish is granted. Villa amenities include an espresso maker, a complimentary minibar, laundry service, and free Wi-Fi. You can spend your day relaxing around the pool, enjoy a range of pampering treatments at the spa, join a yoga session, or even go hot air ballooning. A complimentary chauffeur service to Ubud is available. Located less than a mile from the beach, THE HAVEN offers a variety of luxury accommodation options for couples or families. If you choose one of the Haven Rooms, you will find a spacious modern room with a private balcony overlooking the courtyard pool. If you need more space, you can choose a Haven Suite, which has a separate living area and kitchen, or go for a one or two-bedroom Haven Villa with a private pool. The resort offers a fitness center, yoga and stretching classes, and a kids’ club, and you can take the free shuttle to THE HAVEN Beach Club, where you can enjoy all the Seminyak Beach action from the comfort of your recliner or day bed. There are two on-site restaurants and many other eateries nearby. Couples seeking the peace and tranquility of an adults-only resort close to the arty town of Ubud should look no further than the Kayon Resort. Nestled in the lush tropical rainforest and surrounded by the sacred Petanu River, the Kayon Resort offers a harmonious blend of Balinese architecture and nature. The luxurious rooms and suites will delight guests with their romantic draped king-sized beds, jungle-view balconies, and luxury bathrooms. 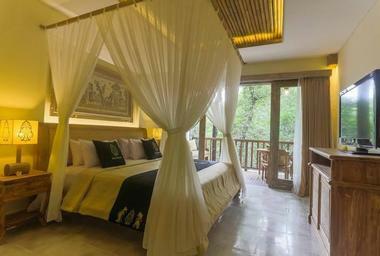 (Some suites directly overlook the river and there are also villas with private pools.) You can enjoy fabulous treatments at the Serayu Spa, join a yoga class, or just relax around the pool. Take home lasting memories of your Balinese experience by joining a cookery class, which includes shopping for ingredients at the local Ubud market. Enjoying an enviable ocean-front location right on Seminyak Beach, The Legian Bali offers an unsurpassed base for your Balinese vacation. Not only will you find yourself right on the beach, you are also close to some of Bali’s most trendy boutiques, restaurants, and night-spots. Whether you choose one of the elegant sea-facing suites or opt to go the extra mile and book the stunning three-bedroom beach house, you will find yourself in the lap of luxury. All suites and villas feature luxury furnishings and fittings, private balconies or terraces, espresso machines, minibars, and sumptuous bathrooms. 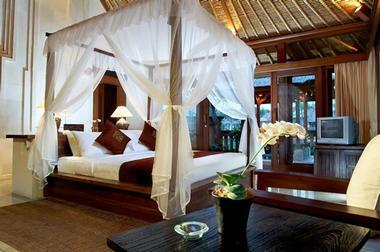 For the ultimate in exclusivity you can book one of the Villas at The Club at Legian. On-site facilities include a fitness center, a spa, a choice of restaurants, and a wonderful pool area. 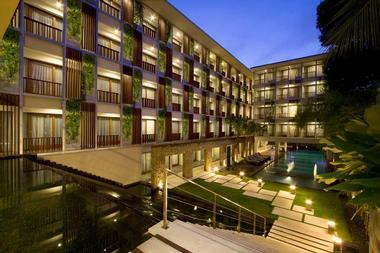 The Oberoi Bali offers guests a little slice of paradise adjacent to the popular Seminyak Beach. Setting the scene for a unique Balinese experience, the grounds of the resort are dotted with genuine old temples, a natural stone amphitheater (where Balinese dance performances are held), and Balinese sculpture. The authentically styled rooms and villas all feature thatch and stone exteriors combined with lavishly appointed interiors and luxury bathrooms. Unique Oberoi experiences include romantic candle-lit beach dinners, luxurious spa treatments, or simply the chance to enjoy Seminyak Beach from the comfort of your private sun bed. A beautiful pool area, two restaurants, and a bar complete the picture. Located mere steps from Bali’s famous Kuta Beach, The Stones Hotel - Legian Bali combines modern architecture, five-star amenities, and sleek, luxurious rooms and suites to set the scene for a memorable Balinese vacation. Rooms and suites boast relaxing minimalist decor in muted tones, accompanied by all the little luxuries you would expect from a five-star establishment – espresso machine, minibar, plush beds and bedding, room service, and rain-showers. The enormous free-form pool is surrounded by comfortable loungers, and pool-side entertainment is provided. You can choose from several on-site restaurants, work up a sweat at the gym, or relax at the spa. Many popular tourist activities are available on your doorstep, including shopping at Beachwalk Bali, a surf school, a canopy adventure park, and much more. If you are looking for a boutique style hotel featuring sumptuously decorated rooms and suites, the Vira Bali Hotel on South Kuta beach could be the perfect choice for you. The rooms and suites all feature distinct Balinese style elements to remind you of where you are and to create a uniquely relaxing environment from which you can explore all the treasures of Bali. Most of the rooms either overlook the pool or have direct pool access and have walk-in showers, tea and coffee making facilities, a personal safe, and cable TV. The De Dari Kitchen and Dip Rock Grill and Bar will take care of your dining needs and you can book a relaxing pampering session at the blissful Anahita Spa. Possibly one of the most romantic hotels in Bali, The Ubud Village Hotel combines principles of feng shui with traditional Balinese style to ensure an atmosphere of holistic indulgence. The hotel is located on Monkey Forest Road, placing guests within walking distance of everything the arty village of Ubud has to offer, from traditional markets, arts and crafts, and boutiques to ancient temples. Your relaxing bedroom features a king-sized bed (or two singles), a sunken bath, air conditioning, satellite TV, and free Wi-Fi. The hotel has two pools surrounded by recliners and sun-shades, a relaxing lobby lounge/library, the Kama Karana Spa, three restaurants, and a roof-top bar. 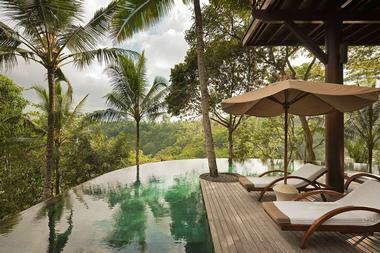 Visitors looking for an exclusive luxury retreat in the heart of the Balinese rainforest will find that the Viceroy Bali, a mere 10 minutes from Ubud, ticks all the boxes. Located on a lofty estate overlooking the lush Valley of the Kings, the Viceroy Bali is home to just 25 luxury pool villas with views over a dramatic jungle ravine. The villas are nothing short of sensational – stylishly furnished in the Balinese tradition and offering the perfect blend of indoor and outdoor space for total relaxation. Everything you need, such as an espresso machine, full satellite TV, Wi-Fi, and room service is on hand. The Lembah Spa is waiting to pamper you, and there is a large infinity pool with swim-up bar and a fitness center. The Cascades Restaurant and Viceroy Bar both offer exceptional jungle views.